In January of 2011 a female Asian elephant named Rebecca died at PAWS. Id like to list what PAWS claimed her cause of death was but they don’t seem to list her on their website along with the other elephants living or deceased. She along with Tinkerbelle and Tamara don’t seem to get memorial status as other elephants like Sabu, 71 or Ruby get. January 2011 was just five months before the Toronto Zoo announced it was going to phase out its elephant exhibit. It is likely that zoo board member and city councillor Glenn DeBaeremaker knew about the report being conducted which had been ordered by new CEO John Tracogna to evaluate the possibility of phasing out the African exhibit and moving the Toronto elephants to a new home. and finally no facility with past or present issue with tuberculosis. They immediately ruled out the elephant sanctuary in Tennessee as they had a documented TB outbreak in 2009 and then a subsequent shake up in their organizational structure with the firing of the sanctuary’s founder Carol Buckley. Some of you are probably wondering how on earth did the zoo board make the decision to send the elephants to PAWS? After they knew PAWS had a tuberculosis outbreak amongst their Asian elephants and had not been forthcoming about it. Well they didn’t, they were ordered to do so by Toronto City Council, led by two zoo board members, Councillor DeBaeremaeker and Councillor Cho and another Councillor, Michelle Berardinetti. They seized control of the elephants as city assets and just chose PAWS without any site visits or due diligence. Just motivated by their emotionally driven personal opinions, anti-zoo propaganda from Zoocheck Canada and kept alive all this time by their egos and extremist ideologies these elephants lives could be at risk, not once but two times now that a 4200km road trip has been added to this reckless decision. You can see Rebecca’s necropsy report here (start p.24) which was made public in April of 2012 after it was accessed via Freedom of Information requests to California State Health. A particular document amongst our FOIA from California State Health caught our eye. In it PAWS vet Dr. Gai, at the time of Rebecca’s death claimed to State Health Officials that they had no idea Rebecca was tuberculosis positive until after she died. Dr. Gai goes on to say that as a result they wore no protective gear. Further documentation evidenced that three elephants, Gypsy, Wanda and Annie were exposed to Rebecca’s TB. The PAWS coalition claimed that there had been quarantines in place but eventually further evidence indicated that these three herdmates of Rebecca had been exposed and two had shown reactions on the STATPAK tests, they knew this as early as June 2011, almost five months before council overruled the professionals at the zoo and seized control of the elephants fate. By June of 2012 Annie sero-converted to active Tuberculosis. Her strain of TB matched one of the two strains found in Rebecca at the time of her death, pretty conclusive evidence that Rebecca infected Annie. And that is on-site transmission and that is also disease prevention protocol failure. The claim of having the world’s best disease prevention protocols was ludicrous to begin with. Tuberculosis is hard to diagnose and hard to treat, no one can make that claim least of all a facility which didn’t even know an animal was actively infected and dying from the disease. We don’t necessarily begrudge PAWS for having trouble with this disease and they did willingly take in animals known to have the disease so one could commend them for that act of kindness. 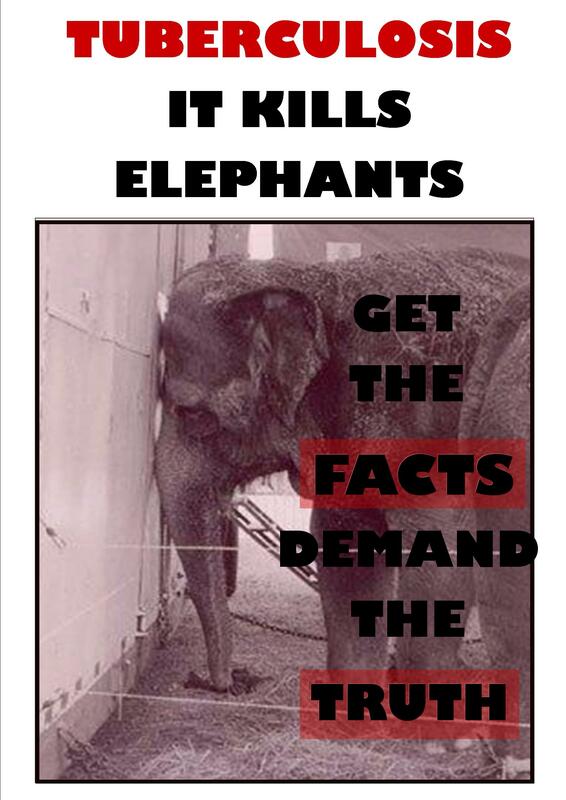 However one cannot accept their lack of honest disclosure about their TB issues in order to acquire the Toronto Zoo elephants at any cost or the subsequent denials in the media when evidence clearly showed the opposite of their claims was true. All the while the PAWS coalition were slamming and vilifying the Toronto Zoo staff for having concerns about the disease. If PAWS had been honest from the beginning the zoo board would have ruled them out as a potential home for the Toronto Zoo elephants. Yes, we know the outbreak was amongst their Asian elephants and not their Africans; you can refer to this blog post to read our thoughts and review our evidence about TB risks within the African herd. Both diagnostic tools (STATPAK and Trunk Wash) failed to diagnose TB in the Asian herd so to claim those same diagnostics clear the African herd of disease makes no sense. Add in the fact that the Asians and Africans shared one barn for almost 5 years and you have what is called a disease risk factor. World class disease prevention protocols do not house a herd with high risk tuberculosis exposure and positive infection histories with another herd just because you don’t have the money to build the necessary other barns which increase your ability to keep animals safe from deadly disease transmission. They had one barn for all the female elephants, both species from 2002-2009. In the case of the TB outbreak at the Tennessee sanctuary the disease was able to travel through ventilation systems with as a result of the use of power washers and infect people working in the adjacent offices. It is not hard to imagine that in a barn with no barriers at all that the disease could easily spread. There was no quarantine facility at PAWS until after Sabu died of TB in January of 2012 and his old barn space became available. Sabu was another elephant whose death from tuberculosis was essentially kept secret from the officials at the Toronto Zoo. They still claim he died from euthanasia due to severe arthritis at age 29yrs even though his necropsy reports state he was TB+ at the time of his death. All efforts by Toronto Zoo vets to contact and work with the PAWS friendly anti captivity Elephant specialist at the USDA, Dr. Denise Sofranko were ignored. She refused to work with the Toronto Zoo vets to assist them with their investigation of tuberculosis at PAWS. At a September 25, 2012 press conference the zoo’s senior vet Dr. Graham Crawshaw spoke to the media. He said that PAWS had been uncooperative and unprofessional regarding their efforts to acquire more information to complete their due diligence, including tissue cultures for an African elephant named Ruby who had died with a bronchial mass on her lung just three months after Rebecca. The mass had not been cultured for tuberculosis, she had a high risk and documented history of exposure to the disease when she lived at the LA Zoo and of course from living in the shared barn at PAWS. Pat Derby had a history of engaging in free contact with all the elephants at PAWS, there are literally hundreds of photographs evidencing this, Ruby had been one of her favourites. The city adopted the Dr. Cork report as an independent infectious disease report to override the zoo’s due diligence process and consider the due diligence to be complete. This report did not include the outstanding medical documents the zoo state is needed. This outstanding information are tissue cultures for two deceased African elephants, Ruby and 71. Since the Toronto Zoo elephants are Africans clearly those cultures are necessary to determine the disease risk factors within the very herd they are to be integrated in to. Those cultures are still outstanding. Our extensive FOIA requests to the USDA, California State Health, and the Center for Disease Control was unable to access these culture reports. They don’t exist, they were never done. Apparently the politicians at City Council are willing to take this risk with the elephant’s lives in order to remain infallible and adhere to their personal dogma. We ask this often but would you let someone do this to your pets? Force your dog to live at a facility with similar disease prevention failures and risk factors? No one who cared about their pets or any animal would allow this to happen so it is hard to understand why people think this is OK for the Toronto Zoo elephants. By zoosmatter in Uncategorized on September 22, 2013 .